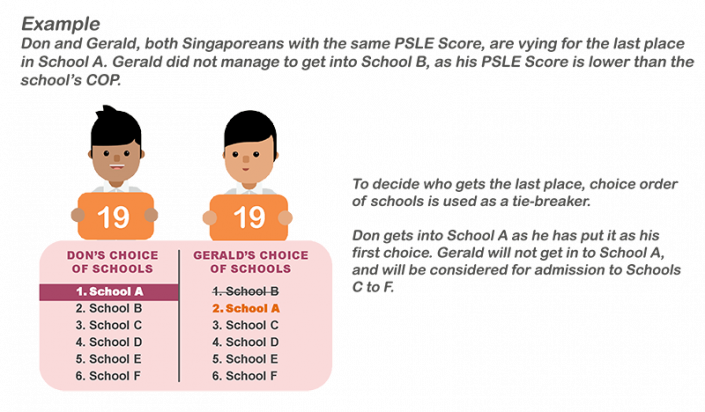 From 2021 onwards, the PSLE will be scored with wider bands and the scores will reflect the student’s individual performance and not his performance relative to his peers. What do the changes mean for you and your child? The T-score will be replaced by wider scoring bands. Each subject will be scored using 8 bands known as Achievement Levels (AL), with AL1 being the best score and AL8 being the lowest score. The ALs reflect the student’s level of achievement in the subject. The student’s total PSLE Score will be the sum of the four subject scores. The PSLE Score will range from 4 (best) to 32. 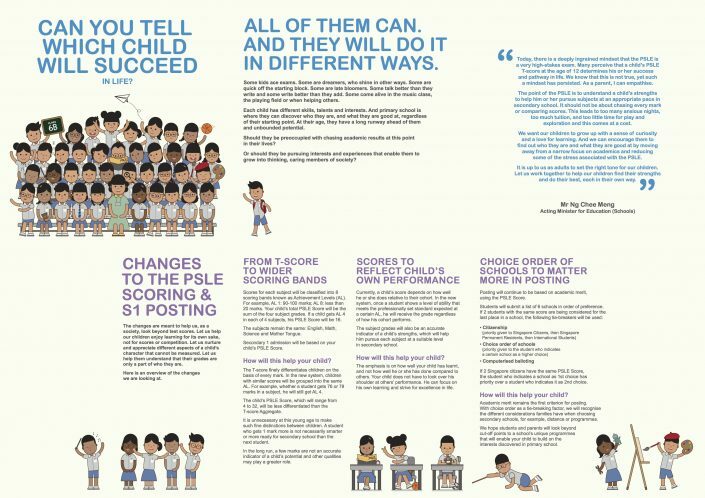 There are 29 possible PSLE Scores, compared to around 200 different T-scores today. This will reduce excessively fine differentiation of students at a young age. Once a student shows a level of achievement that meets the learning objectives of the curriculum expected at a certain AL, he will receive the AL regardless of how his peers perform. The emphasis is on how well the student has learnt, and not how well he has done compared to others. We want our children to focus on their own learning instead of trying to outdo others. Students will continue to be assigned to Express, Normal (Academic) and Normal (Technical) courses. This enables us to better customise our teaching to support the needs of the children, so they can learn at a pace comfortable to them and make good progress. S1 Posting will continue to be based on academic merit first, but choice order of schools will also matter more under the new system. We encourage parents and students to consider factors beyond cut-off points, and make choices based on whether a school’s culture, ethos and programmes are a good fit for the child’s interests and strengths. Posting will continue to be based on academic merit, using the PSLE Score. 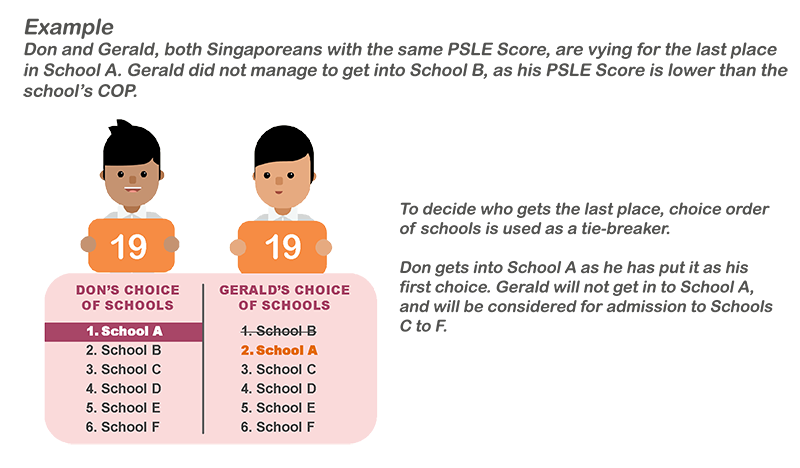 Choice order as a tie-breaker is designed to recognise the different considerations that families have when choosing secondary schools, for example the school’s ethos, culture, programmes and CCAs, as well as distance between the school and home. 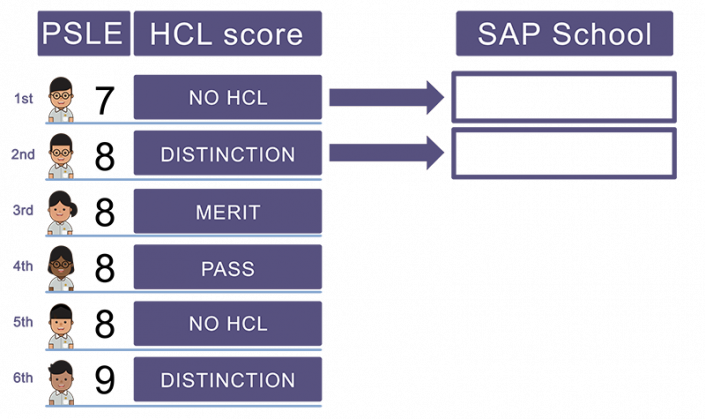 When applying to SAP schools, HCL students will continue to receive an advantage. 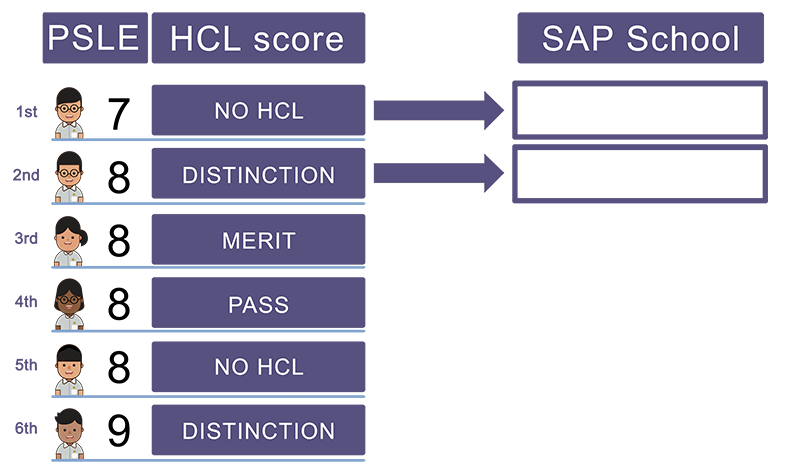 Although HCL results do not count towards the PSLE Score, if students with the same PSLE Score are vying for limited places in the same SAP school, those with better HCL grades will be allocated a place ahead of other students. This applies before the tie-breakers for S1 posting. Let’s look at an example. There are 6 students competing for the last 2 places in a SAP school. They have been arranged in descending order of posting priority. The student who has a PSLE Score of 7 will gain admission to the SAP school. Then, out of the students with a PSLE Score of 8, the student with a distinction for HCL will be admitted into the SAP school next, ahead of the other students who also scored 8 but had poorer or no HCL score. The advantage that HCL students will obtain under the new system is similar to that under the current system. HOW SHOULD YOU CHOOSE A SECONDARY SCHOOL? We encourage parents to discuss with their children when choosing secondary schools. When selecting schools, students and parents should look at the child’s fit with the school. More information on secondary schools can be found on the School Information Service, the respective school websites and in the Secondary One Posting booklet given to students in Primary 6. Secondary schools also hold open houses where students and parents can learn more about the school’s programmes, and speak with teachers and students. To help parents choose schools of the appropriate academic profile in the first year under the new system, MOE will be providing simulated ranges of cut-off points of secondary schools. However, the actual cut-off points may differ, depending on how students and parents actually exercise their choices that year. However, we encourage parents to look beyond cut-off points and to also consider a school’s unique programmes that will enable your children to build on the strengths and interests.